Living in a NYC apartment, it is essential to find home scents you love because you are forever masking the odors and smells of the hundreds of neighbors you have just feet from your door. Everyone is in such close quarters in most of these buildings, I want to walk into my apartment and immediately be greeted by a pleasant scent, and one that makes me feel at ease. Now it's no secret that I have come to adore the Nest Fragrances brand, both home scents and personal fragrances, and when they graciously sent over their newest summer launch, Sicilian Tangerine, I was in heaven once again. I am a huge fan of anything citrus based, and just from the packaging and name alone I could envision how sweet and inviting this would smell. And of course, I was right. With notes of tangerine, mango, bergamot and passion fruit, it smells fresh and exotic - like a tropical resort right in my home. Someone get me an umbrella for my drink! I would love to say a candle is just a candle, but after using Nest products for so long, I realize that is not the case. A home fragrance should permeate the room in a soft and inviting way without overpowering. I am already beginning to stock up on some scents to give the apartment a new feel for fall so stay tuned. I agree! 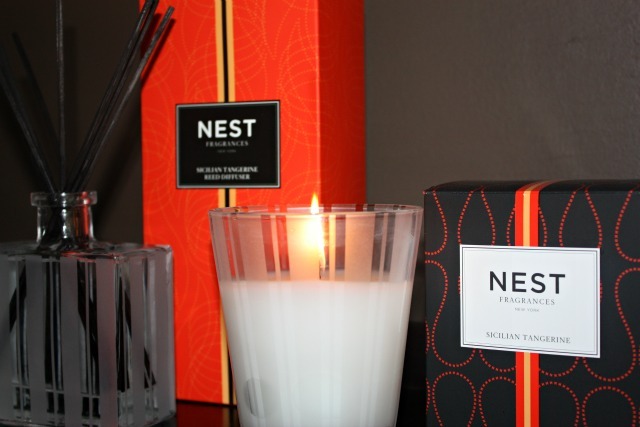 Nest is just best of breed and this scent is perfect for late summer.